The NASA mission looks like it’s getting comfortable in Elysium Planitia. Like any self-respecting social media influencer, Mars’s latest resident is hard at work snapping photos of its new digs. The robot has even thrown in a beautiful selfie for good measure. NASA’s InSight lander touched down on the Red Planet on Nov. 26 and since then its mission controllers have been hard at work checking out the instrumentation and surroundings. Using its Instrument Deployment Camera, or IDC, InSight has been giving us a tour of its permanent home. Fans on social media have even been nominating names for the rocks that can be seen embedded in the dusty regolith — the only rocks we’ll see close up for the duration of the mission. Very early on, NASA scientists knew they’d landed in the right place. The beautifully-flat plain of Elysium Planitia has a landscape that is in stark contrast to Curiosity’s Mount Sharp environment; instead of seeing a smorgasbord of geological features — created by ancient water action and ongoing aeolian (wind-blown) processes — Elysium is flat, dusty and appears to only have small-ish rocks strewn over its surface. You see, InSight cares little for what’s on the surface; the science it’s after lies below the stationary lander, all the way to the planet’s core. Now that InSight’s raw image archive is churning out new pictures daily, mission scientists are scoping out its “work space” directly in front of the lander’s robotic arm. Over the coming weeks, optimal positions for InSight’s two main experiments — the Seismic Experiment for Interior Structure (SEIS) and Heat Flow and Physical Properties Package (HP3) —will be decided on and then commands will be sent to the lander to begin the painstaking task of retrieving them from its deck and setting them down on the ground. The main task will be to determine exact locations that are smooth, flat and contain small rocks that are no bigger than half an inch. This will ensure stable contact with the ground so seismic and heat flow measurements can be continuously carried out. InSight is basically going to give Mars an internal examination 24/7, listening to the slightest seismic waves like a doctor would listen to your heartbeat. And it looks like InSight has landed inside a depression, likely created by an ancient crater that has been filled with loose material over time — this is great news for HP3 that has a self-digging probe (called the “mole”) that will now have an easier task of burrowing meters underground. This photo is a mosaic composed of 11 different images snapped by the lander’s robotic arm-mounted camera. You can see the lander’s open solar panels and stowed instrumentation on the deck, including SEIS and HP3. And no, the selfie isn’t a fake; by sticking a bunch of individual photos together, they’ve overlapped to edit out any trace of the arm itself. Curiosity does the same thing; so did Opportunity and Spirit. InSight’s older sibling, Phoenix also did it. Selfies are as much the rage on Mars as they are on Earth. Not only do they look cool, they are also useful for mission controllers to monitor the build-up of dust on solar panels, for example. For now, as we await the science to start flowing in (well, there’s been some early science before the robot has even gotten started), enjoy checking back on InSight’s raw photos, it won’t be long until we’ll be browsing through potentially thousands of snaps from Elysium Planitia. Oh, and don’t forget about Curiosity that’s still going strong on the slopes of Mount Sharp! Voyager 1 made us an interstellar species; 6 yrs later, Voyager 2 makes it look easy. While these are historic, soul-stirring achievements, I am most happy right now that Ed Stone, the best Project Scientist who ever lived, lived to see this moment. It can be easy to lump today’s announcement about Voyager 2 entering interstellar space as “simply” another magnificent science achievement for NASA — but that would be too narrow; the Voyager spacecraft have become so much more. They represent humanity at our best; our will to explore, our need to push boundaries, our excitement for expanding the human experience far beyond terrestrial shores. They also act as a means to understand the sheer scale of our solar system. And what better way to measure that scale than with a human life. Ed Stone started working on the Voyager Program in 1972 as a project scientist. Now, at 82 years old, he’s still working on the Voyagers nearly half a century later as they continue to send back data from the frontier beyond our solar system. When we start measuring space missions in half-centuries, or missions that have lasted entire careers, it becomes clear how far we’ve come. Not only does NASA build really tough space robots that surpass expectations routinely, returning new discoveries and revelations about the universe that surrounds us, the Voyagers have become a monument to the essence of being human, something with which Stone would probably agree. Although most of the instruments aboard the Voyagers are no longer functional, both missions are still returning data from the shores of the interstellar ocean and, on Nov. 5, mission controllers noticed that one of Voyager 2’s instruments, the Plasma Science Experiment (PSE), had detected a rapid change in its surrounding environment. Used to being immersed the comparatively warm and tenuous solar wind flowing past it, its plasma measurements detected a change. The spacecraft had passed into a region of space where the plasma was now denser and cooler. Three other particle experiments also detected a dramatic change; solar wind particle counts were down, but cosmic ray counts precipitously increased. Voyager 1’s PSE failed in 1980, so couldn’t measure this boundary when it entered interstellar space in 2012, so Voyager 2 is adding more detail about what we can expect happens when a spacecraft travels from the heliosphere, through the heliopause and into interstellar space. “There is still a lot to learn about the region of interstellar space immediately beyond the heliopause,” said Stone in a NASA statement. The heliosphere can be imagined as a vast magnetized bubble that is generated by the Sun. This bubble is inflated by the solar wind, a persistent stream of solar particles that ebb and flow with the Sun’s 11-year cycle. When the Sun is at its most active, the bubble expands; at its least active, it contracts. This dynamic solar sphere of influence affects the flux of high-energy cosmic rays entering the inner solar system, but the physics at this enigmatic boundary is poorly understood. With the help of the Voyagers, however, we’re getting an in-situ feel for the plasma environment at the boundary of where the Sun’s magnetism hits the interstellar medium. To achieve this, however, we had to rely on two spacecraft that were launched before I was born, in 1977. Voyager 2 is now 11 billion miles away (Voyager 1 is further away, at nearly 14 billion miles) and it took the probe 41 years just to reach our interstellar doorstep. Neither Voyagers have “left” the solar system, not by a long shot. The gravitational boundary of the solar system is thought to lie some 100,000 AU (astronomical units, where one AU is the average distance from the Earth to the Sun), the outermost limit to the Oort Cloud — a region surrounding the solar system that contains countless billions of icy objects, some of which become the long-period comets that intermittently careen through the inner solar system. Voyager 2 is barely 120 AU from Earth, so as you can see, it has a long way to go (probably another 30,000 years) before it really leaves the solar system — despite what the BBC tells us. So, tonight, as we ponder our existence on this tiny pale blue dot, look up and think of the two space robot pioneers that are still returning valuable data despite being in deep space for over four decades. I hope their legacy lives on well beyond the life of their radioactive generators, and that the next interstellar spacecraft (no pressure, New Horizons) lives as long, if not longer, than the Voyagers. Read more about today’s news in my article for HowStuffWorks.com. It’s always fun to browse through the raw image archive for any Mars mission. You see rocks, dust, more rocks and more dust, but then you see something strange, sitting atop the dirt that is like nothing you’ve seen before. Once, there was a piece of plastic on the ground in front of Curiosity. Plastic! Not alien plastic though, it was likely something that fell off the rover. Mars rover Opportunity even found strange “blueberries” scattered over Meridiani Planum that turned out to be spherical hematite inclusions, basically little balls of mineral that were formed via water action in Mars’ ancient past. Now there’s a shiny rock just sitting there, in front of Curiosity. Mars isn’t known for its shiny objects. Everything is a ruddy color (because of the iron-oxide-laced dust that covers everything) and dull. So, when mission controllers saw this small shiny object, it became a focus of interest. They’ve even named it “Little Colonsay.” Don’t get too excited for an explanation that’s too outlandish, but it will be an interesting find if it turns out to be what scientists think it is. “The planning team thinks it might be a meteorite because it is so shiny,” writes Susanne Schwenzer, Curiosity mission team member. Meteorites have been discovered on Mars before by the Mars rovers — and Curiosity is no stranger to finding space rocks strewn on the ground — though it would still be a rare find by Curiosity if it does turn out to be a (likely) metallic chunk of space rock. As pointed out by Schwenzer, the team intend to carry out further analysis of the sample, as well as some other interesting rocks, with Curiosity’s ChemCam instrument to decipher what it’s made of. So as we welcome the InSight mission to the Red Planet to begin its unprecedented study of Mars’ interior, always remember there’s still plenty of gems sitting on the surface waiting to be found. After following InSight’s journey and dramatic landing on Mars, I’m now emotionally attached to the space robot. It’s funny how our perception of the robots we send into space changes with the experiences we have with them. Take NASA’s InSight lander, for example. I was thrilled to be able to see the mission launch on May 5 from my backyard. I was following the launch feed from my office in the early hours of the morning — lift-off was just after 4 a.m., so I was particularly proud that I hadn’t fallen asleep in my home office. Going outside, I looked to the northwest in hopes of glimpsing the light of the Atlas V-401 rocket as it rose into the dark pre-dawn skies. After I’d seen confirmation via the live-stream video of launch from Vandenburg Air Force Base (130 miles to the northwest of my home in Woodland Hills), I stood precariously on a patio chair to get a better view over my roof and… there it was! A bright plume rising and moving very fast toward the south. And then it was gone; the first ever mission to Mars launched from California was on its way into interplanetary space. Needless to say, I quickly became invested in this space robot, but before I witnessed its launch from afar, it was another anonymous piece of cold space hardware. As soon as I saw its rocket plume, the mission became “real” and InSight was warmly embedded in my emotions. NASA likes to play up the dangers of sending missions to Mars — and I can’t blame them; more Mars missions have failed than have succeeded. But in recent years, NASA has beaten the odds and landed all of their surface missions and inserted a bunch of satellites into orbit successfully. The last failed NASA mission to Mars was nearly 20 years ago (the Mars Polar Lander in 1999), everything else since — Mars Odyssey, the two Mars Exploration Rovers, Mars Reconnaissance Orbiter, Phoenix lander (InSight’s twin), Curiosity, MAVEN — have all been resounding successes. JPL’s “lucky peanuts” at mission control obviously paid off. Then, on Monday (Nov. 26), after nearly seven months since I saw it fly over my roof, InSight landed on the dusty surface of Mars. I was fortunate to be at NASA’s Jet Propulsion Laboratory (JPL) on that day, covering the event for Scientific American and HowStuffWorks, and it was a thrill to be in the hub of all the festivities and spend time with my fellow science communicators. JPL always puts together a great event — whether that be the landing of Curiosity over six years ago, or the sad farewell of Cassini last year — and this was no different. The air was thick with anticipation, and all of the mission scientists, managers and engineers were more than willing to share their stories with the dozens of journalists, reporters, social media peeps and TV crews who were in attendance. Then it was time for landing. Sending a mission to Mars is risky and, as already pointed out, in the earlier days of humanity throwing stuff at Mars the majority of the missions failed. So, understandably, everyone had a healthy level of nervousness that there was always a chance that InSight might just make another (expensive) crater in the Martian dirt. But that wasn’t to be. And by all accounts, the landing couldn’t have gone better. The two Mars Cube One (MarCO) spacecraft that were flying with InSight during its time cruising from Earth became the undisputed silicon heroes of the day. Their purpose was to relay telemetry data from InSight as the lander slammed into the Martian atmosphere to commence its hair-raising entry, descent and landing (EDL) on Mars — a.k.a. the Seven Minutes or Six and a Half Minutes Of Terror, depending on who you talk to. As InSight would be landing in a region where there wouldn’t be a satellite overpass for several hours after landing, MarCO became the relay that, in real time (minus the several minute lag-time that it takes for any signal to travel at the speed of light between Mars and Earth) prevented too many chewed fingernails and passed the message to mission control that the lander had landed safely and everything was, well, just perfect. In the media area, with a live feed streaming from just next door on the JPL campus, any nervousness evaporated when we all cheered with the mission controllers who were celebrating on the screen. Memories of Curiosity’s landing came flooding back. NASA has done it again, we’re on Mars! And then, despite warnings that it might be some time before we see the first view of Elysium Planitia from InSight’s camera, we became aware that the mood had changed in mission control. Managers were now huddled around a computer terminal. They were receiving the first image only a few minutes after touch down! Keep in mind that relaying this image would have been impossible without InSight’s MarCO travel buddies. The success of the mission didn’t depend on MarCO, but they sure made the landing event a more lively celebration, rather than a “yes we’re on Mars, but no pictures until tomorrow!” anticlimax. I asked a couple of the MarCO managers what was next for their robotic heroes, and they said that their mission was complete and that they were a proof of concept “that was now proven.” Apparently, managers for other robotic space missions are planning MarCO-like payloads for future missions. Justifiably so. Monday was a blur, but I remember walking away from JPL feeling emotional and humbled. Humanity is capable of doing incredible, bold things, I thought to myself. Why can’t we be more like this? Discussing the nature of humanity and our contradictory ways can be saved for another day, however. Now that we’ve lived InSight’s dramatic journey to Mars, the lander has become more than a robot, it’s a bona fide Mars explorer that, like Curiosity and all the landers and rovers that have come before it, is an extension of the human experience. Designed to live in the Martian environment, InSight has arrived home. Hopes are high for some incredible scientific discoveries about Mars’ interior and its evolution, but I’m also hopeful that the mission will inspire people to embrace our natural urge to explore and discover new things about our universe. This time exploration will be done through the eyes of the newest space robot to join its Martian family, but some time in the next couple of decades, it will be human eyes exploring Elysium Planitia. When rains came to one of the driest places on Earth, an unprecedented mass extinction ensued. 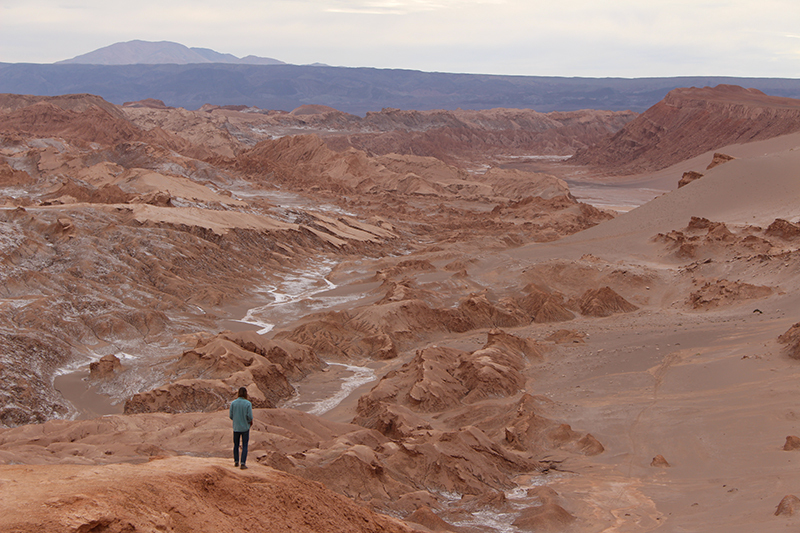 The assumption was that this rainfall would turn this remote region of the Atacama Desert in Chile into a wondrous, floral haven — dormant seeds hidden in the parched landscape would suddenly awake, triggered by the “life-giving” substance they hadn’t seen for centuries — but it instead decimated over three quarters of the native bacterial life, microbes that shun water in favor of the nitrogen-rich compounds the region has locked in its dry soil. In other words, death fell from the skies. “We were hoping for majestic blooms and deserts springing to life. Instead, we learned the contrary, as we found that rain in the hyperarid core of the Atacama Desert caused a massive extinction of most of the indigenous microbial species there,” said astrobiologist Alberto Fairen, who works at Cornell Cornell University and the Centro de Astrobiología, Madrid. Fairien is co-author of a new study published in Nature’s Scientific Reports. Climate models suggest that these rains shouldn’t hit the core regions of Atacama more than once every century, though there is little evidence of rainfall for at least 500 years. Because of the changing climate over the Pacific Ocean, however, modern weather patterns have shifted, causing the weird rain events of March 25 and Aug. 9, 2015. It also rained more recently, on June 7, 2017. Besides being yet another reminder about how climate change impacts some of the most delicate ecosystems on our planet, this new research could have some surprise implications for our search for life on Mars. Over forty years ago, NASA carried out a profound experiment on the Martian surface: the Viking 1 and 2 landers had instruments on board that would explicitly search for life. After scooping Mars regolith samples into their chemical labs and adding a nutrient-rich water mix, one test detected a sudden release of carbon dioxide laced with carbon-14, a radioisotope that was added to the mix. This result alone pointed to signs that Martian microbes in the regolith could be metabolizing the mixture, belching out the CO2. Alas, the result couldn’t be replicated and other tests threw negative results for biological activity. Scientists have suggested that this false positive was caused by inorganic reactions, especially as, in 2008, NASA’s Phoenix Mars lander discovered toxic and highly reactive perchlorates is likely common all over Mars. Since Viking, no other mission has attempted a direct search for life on Mars and the missions since have focused on seeking out water and past habitable environments rather than directly testing for Mars germs living on modern Mars. With this in mind, the new Atacama microbe study could shed some light on the Viking tests. Though the out-gassing result was likely a false positive, even if all the samples collected by the two landers contained microscopic Martians, the addition of the liquid mix may well have sterilized the samples — the sudden addition of a large quantity of water is no friend to microbial life that has adapted to such an arid environment. “Our results show for the first time that providing suddenly large amounts of water to microorganisms — exquisitely adapted to extract meager and elusive moisture from the most hyperdry environments — will kill them from osmotic shock,” said Fairen. Another interesting twist to this research is that NASA’s Mars rover Curiosity discovered nitrate-rich deposits in the ancient lakebed in Gale Crater. These deposits might provide sustenance to Mars bacteria (and may be a byproduct of their metabolic activity), like their interplanetary alien cousins in Atacama. As water-loving organisms, humans have traditionally assumed life elsewhere will bare similar traits to life as we know it. But as this study shows, some life on Earth can appear quite alien; the mass extinction event in the high deserts of Chile could teach us about how to (and how not to) seek out microbes on other planets. When ʻOumuamua visited our solar system last year, the world’s collective interest (and imagination) was firing on all cylinders. Despite astronomers’ insistence that asteroids from other star systems likely zip through the solar system all the time (and the reason why we spotted this one is because our survey telescopes are getting better), there was that nagging sci-fi possibility that ʻOumuamua wasn’t a natural event; perhaps it was an interstellar spaceship piloted by (or at least once piloted by) some kind of extraterrestrial — “Rendezvous With Rama“-esque — intelligence. Alas, any evidence for this possibility has not been forthcoming despite the multifaceted observation campaigns that followed the interstellar vagabond’s dazzling discovery. Still, I ponder that interstellar visitor. It’s not that I think it’s piloted by aliens, though that would be awesome, I’m more interested in the possibilities such objects could provide humanity in the future. But let’s put ʻOumuamua to one side for now and discuss a pretty nifty project that’s currently in the works and how I think it could make use of asteroids from other stars. As recently announced by the European Space Agency, researchers at Delft University of Technology, Netherlands, are designing a starship. But this isn’t your run-of-the-mill solar sail or “warpship.” The TU Delft Starship Team, or DSTART, aims to bring together many science disciplines to begin the ground-work for constructing an interstellar vehicle hollowed out of an asteroid. Obviously, this is a long-term goal; humanity is currently having a hard enough time becoming a multiplanetary species, let alone a multistellar species. But from projects like these, new technologies may be developed to solve big problems and those technologies may have novel applications for society today. Central to ESA’s role in the project is an exciting regenerative life-support technology that is inspired by nature, a technology that could reap huge benefits not only for our future hypothetical interstellar space fliers. Called the MELiSSA (Micro-Ecological Life Support System Alternative) program, scientists are developing a system that mimics aquatic ecosystems on Earth. A MELiSSA pilot plant in Barcelona is capable of keeping rat “crews” alive for months at a time inside an airtight habitat. Inside the habitat is a multi-compartment loop with a “bioreactor” at its core, which consists of algae that produces oxygen (useful for keeping the rats breathing) while scrubbing the air of carbon dioxide (which the rats exhale). The bioreactor was recently tested aboard the International Space Station, demonstrating that the system could be applied to a microgravity environment. Assuming that humanity isn’t going to discover faster-than-light (FTL) travel any time soon, we’re pretty much stuck with very pedestrian sub-light-speed travel times to the nearest stars. Even if we assume some sensible iterative developments in propulsion technologies, the most optimistic projections in travel time to the stars is many decades to several centuries. While this is a drag for our biological selves, other research groups have shown that robotic (un-crewed) missions could be done now — after all, Voyager 1 is currently chalking up some mileage in interstellar space and that spacecraft was launched in the 1970’s! But here’s the kicker: Voyager 1 is slow (even if it’s the fastest and only interstellar vehicle humanity has built to date). If Voyager 1 was aimed at our closest star Proxima Centauri (which it’s not), it would take tens of thousands of years to get there. But say if we could send a faster probe into interstellar space? Projects like Icarus Interstellar and Breakthrough Starshot are approaching this challenge with different solutions, using technology we have today (or technologies that will likely be available pretty soon) to get that travel time down to less than one hundred years. Sending robots to other stars is hard and it would take generations of scientists to see an interstellar mission through from launch to arrival — which is an interesting situation to ponder. But add human travelers to the mix? The problems just multiplied. The idea of “worldships” (or generation ships) have been around for many years; basically vast self-sustaining spaceships that allow their passengers to live out their lives and pass on their knowledge (and mission) to the next generation. These ships would have to be massive and contain everything that each generation needs. It’s hard to comprehend what that starship would look like, though DSTART’s concept of hollowing out an asteroid to convert it into an interstellar vehicle doesn’t sound so outlandish. To hollow out an asteroid and bootstrap a self-sustaining society inside, however, is a headache. Granted, DSTART isn’t saying that they are actually going to build this thing (their project website even states: “DSTART is not developing hardware, nor is it building an actual spacecraft”), but they do assume some magic is going to have to happen before it’s even a remote possibility — such as transformative developments in nanotechnology, for example. The life-support system, however, would need to be inspired by nature, so ESA and DSTART scientists are going to continue to help develop this technology for self-sustaining, long-duration missions, though not necessarily for a massive interstellar spaceship. Though interesting, my reservation about the whole thing is simple: even if we did build an asteroid spaceship, how the heck would we accelerate the thing? This asteroid would have to be big and probably picked out of the asteroid belt. The energy required to move it would be extreme; to propel it clear of the sun’s gravity (potentially via a series of gravitational assists of other planets) could rip it apart. The reason why astronomers knew ʻOumuamua wasn’t from ’round these parts was that it was moving really, really fast and on a hyperbolic trajectory. It basically barreled into our inner star system, swung off our sun’s gravitational field and slingshotted itself back toward the interstellar abyss. So, could these interstellar asteroids, which astronomers estimate are not uncommon occurrences, be used in the future as vehicles to escape our sun’s gravitational domain? Assuming a little more science fiction magic, we could have extremely advanced survey telescopes tasked with finding and characterizing hyperbolic asteroids that could spot them coming with years of notice. Then, we could send our wannabe interstellar explorers via rendezvous spacecraft capable of accelerating to great speeds to these asteroids with all the technology they’d need to land on and convert the asteroid into an interstellar spaceship. The momentum that these asteroids would have, because they’re not gravitationally bound to the sun, could be used as the oomph to achieve escape velocity and, once setting up home on the rock, propulsion equipment would be constructed to further accelerate and, perhaps, steer it to a distant target. If anything, it’s a fun idea for a sci-fi story. I get really excited about projects like DSTART; they push the limits of human ingenuity and force us to find answers to seemingly insurmountable challenges. Inevitably, these answers can fuel new ideas and inspire younger generations to be bolder and braver. And when these projects start partnering with space agencies to develop existing tech, who knows where they will lead. If you follow me on Twitter, you’ll probably know my (conflicted) feelings about Elon Musk blasting his cherry red Tesla roadster into space. But there’s one angle of the whole “I’m a billionaire and it’s my rocket company, I can do what the hell I like” saga I hadn’t considered: That same red roadster was carrying a potential biological weapon into space. Conversely, it might be the biological equivalent of Noah’s Ark. As the vehicle wasn’t designed (or, indeed, intended) for a planetary encounter (whether that be Mars, Earth or some random asteroid), NASA’s Office of Planetary Protection had no jurisdiction over the test launch of the SpaceX Falcon Heavy from Cape Canaveral, Fla., on Feb. 6. The Tesla roadster acted as the test mass for the launch, outfitted with a space-suited mannequin (or not) — a.k.a. “Starman” — with David Bowie’s “Space Oddity” playing on the radio and a “Don’t Panic” homage to Douglas Adams’ “The Hitchhiker’s Guide to the Galaxy” showing on the car’s display. There was a lot going on with that controversial launch, but no one can dispute that it wasn’t a marketing masterstroke. Yeah, it was a memorable day. So, back to planetary protection. Or, more precisely, lack thereof. Also, this wan’t a new car. And no number of details would have removed terrestrial bacteria from the wheels, engine, upholstery and uncountable nooks and crannies bacteria have set up home. And if it’s been driven on Los Angeles roads… well, yuck. Put simply, this car wasn’t subject to the rigorous sterilization procedures spacecraft are subject to. Space roadster proponents will probably argue that this car isn’t intended to launch a germy invasion party to any planetary body; it was blasted into open space and not likely to hit anything solid for millions of years. It’s just going to be an artificial satellite of the Sun, nothing more. Bacteria are hardy little buggers and even the frozen radioactive vacuum of space wont be enough to eradicate every microbe from inside that vehicle. Many strains of microbe will simply shut down and hibernate for extreme periods of time until they get heated back up and watered. And, as far as I’m aware, there was no attempt by SpaceX at protecting the extraterrestrial neighborhood from humanity’s germs (besides, why would they? ), so there is likely a menagerie of microbial biomass hitching a ride. Some scientists, being optimistic beings, view this differently, however. Far from being a germ-bomb waiting to smear its humanity’s snot over the pristine slopes of Olympus Mons, the Tesla might actually be a clever way of backing up Earth’s genetic information for the eons to come, regardless of what happens to life on Earth. “The load of bacteria on the Tesla could be considered a biothreat, or a backup copy of life on Earth,” said Alina Alexeenko, professor of aeronautics and astronautics at Purdue, who specializes in freeze-drying bacteria. There’s a larger question here, beyond the hype and the probability that the roadster will be a harmless addition to the Sun’s asteroid family; as commercial spaceflight is obviously in its infancy, who’s job is it to ensure payloads are clean? Is it even a priority? Sure, this SpaceX launch won’t likely hit Mars or even Earth, but what about future “test” launches? How much dirty space junk is too much? If you thought detecting small planets orbiting stars dozens of light-years distant was impressive, imagine trying to “see” individual comets zoom around their star. Well, astronomers have done just that after poring over 201,250 targets in the Kepler dataset. NASA’s Kepler mission has been taking observational data since 2009, staring unblinkingly at a small area of sky in the direction of the constellation Cygnus until it transitioned into the K2 mission in 2013. In total, the space telescope has discovered over 2,500 confirmed exoplanets (and over 5,000 candidate exoplanets), transforming our understanding of the incredible menagerie of alien worlds in our galaxy. After including discoveries by other observatories, we know of over 3,500 exoplanets that are out there. Kepler detects exoplanets by watching out for periodic dips in the brightness of stars in its field of view. Should a slight dip in brightness be detected, it could mean that there’s an exoplanet orbiting in front of its host star—an event known as a “transit.” While these transits can help astronomers learn about the physical size of exoplanets and the period of their orbits, for example, there’s much more information in the transit data than initially meets the eye. In a new study to be published in the journal Monthly Notices of the Royal Astronomical Society on Feb. 21, a team of researchers are reporting that they have found evidence for individual comets transiting in front of two stars. They detected six individual transits at the star KIC 3542116, which is located approximately 800 light-years from Earth, and one transit at KIC 11084727. Both stars of a similar type (F2V) and are quite bright. One comet’s three transits around its host star, KIC 3542116. Credit: Rappaport et al. MNRAS 474, 1453, 2018. Using these transit data, the study also takes a stab at how big these comets are and even estimates their orbital velocities. The researchers calculate that these comets have masses that are comparable to Halley’s Comet, the famous short-period comet that orbits the sun every 74-79 years and was last visible from Earth in 1986. For the deeper transits (for KIC 3542116 and the single transit at KIC 11084727), they estimate that the comets causing those transits are travelling at speeds of between 35 to 50 kilometers per second (22 to 31 miles per second). For the shallow, narrow transits at KIC 3542116, the inferred speeds are between 75 to 90 kilometers per second (47 to 56 miles per second). “From these speeds we can surmise that the corresponding orbital periods are ⪆ 90 days (and most probably, much longer) for the deeper transits, and ⪆ 50 days for the shorter events,” they write. But the fact that comets were detected at two similar F2V-type stars gives the researchers pause. Is there something special about these stars that means there’s more likelihood of possessing comets? Or is it just chance? Also, the fact that these comet transits were identified by visually analyzing the Kepler datasets suggests that there are likely many more transits hiding in the archived Kepler observations. One thing’s for sure: this is a mind-blowing discovery that underscores just how valuable exoplanet-hunting missions are for probing the environment around other stars and not just for discovering strange new worlds. I’m excited for what other discoveries are waiting in Kepler transit data and for future exoplanet-hunting missions such as NASA’s Transiting Exoplanet Survey Satellite (TESS) that is scheduled for launch this year.